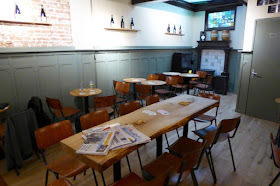 Despite being dead busy with my new Scottish book, I took some time off on Saturday to visit yet another new beer pub. 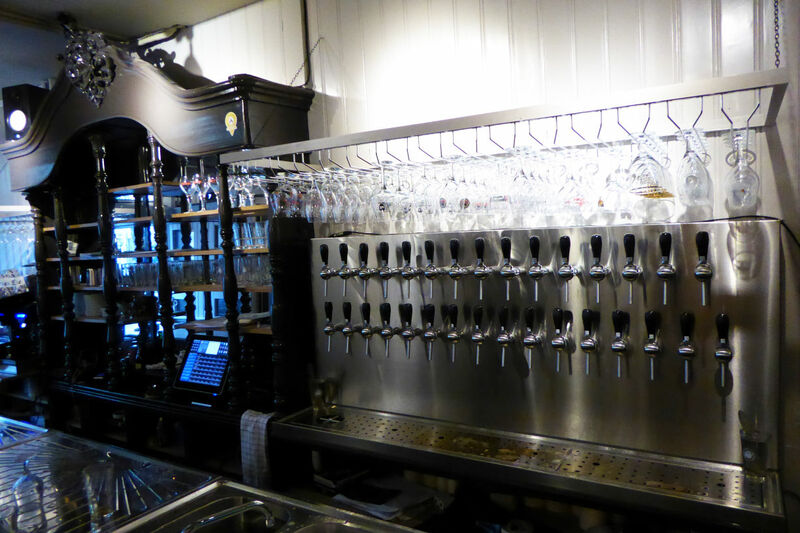 It's getting impossible to keep up with the beer scene in Amsterdam. 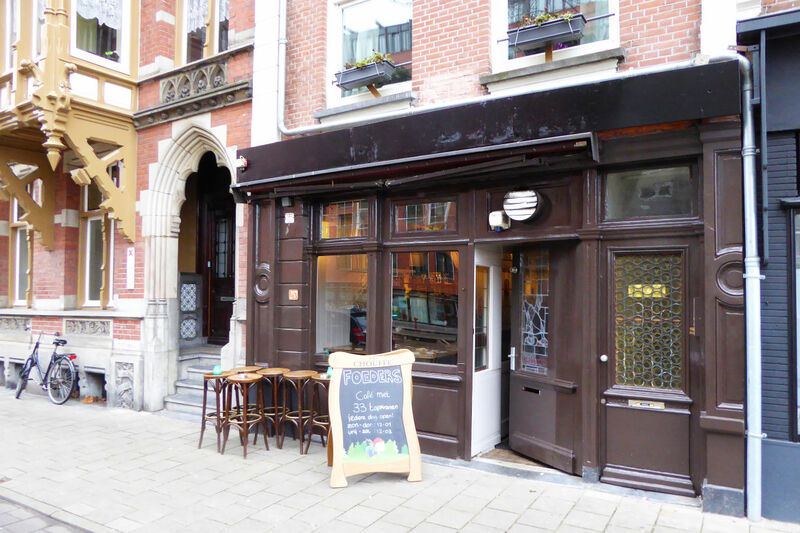 John Clarke tipped me off about another new beer bar in the Pijp, Foeders. I thought I'd best check it out. Especially as it seemed rather more pub-like than last weeks visit, The Wateringhole. Having a Dutch name is a good start. Foeders is located in a slightly out of the way bit of the Pijp, close to the Amstel river. It's also next door to the most extravagently attractive appartment building on the whole of Ceintuurbaan. Annoyingly, the tram stop that used to be directly outside the pub has been discontinued. Bastards at the GVB. The lovely leeded glass door panel sets a pleasant tone on the way in. Once past it, the lingering smell of paint betrays how recently the place has opened. There's a definite Amsterdam feel inside, though with a few modern touches. The green paint scheme always makes me think of Amsterdam's jenever bars, which are lovely old pubs. At the back is a tiled fireplace. Typically Dutch. The long bar down one wall is surprisingly low. Though you do sometimes see that in older Amsterdam pubs And there's a pretty carved bar back. Overall, pretty good. Not bland at all and with a definite Amsterdam feel. 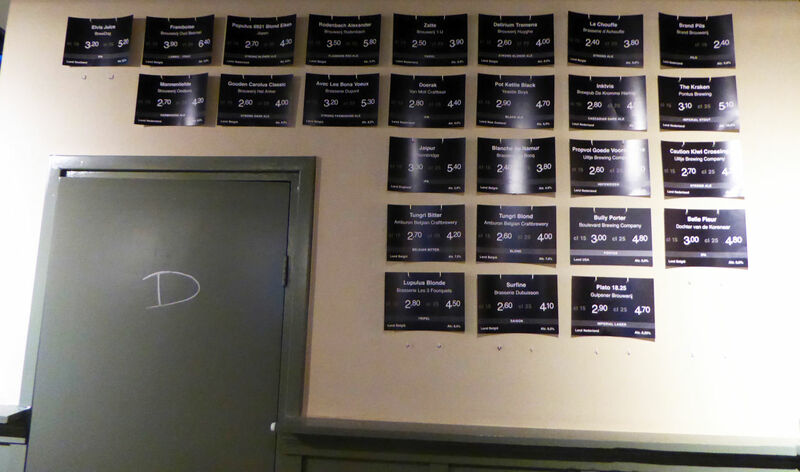 Only real negative point: having the draught beer display on the back wall above the door to the ladies lavs, well away from the bar and the taps. Not very handy. 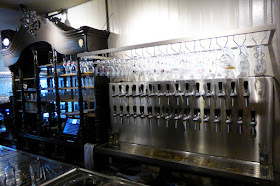 As for beers, there's a mix of old Belgian favourites like La Chouffe and Rodenbach, some local stuuff like Ij and Oedipus, plus some craft stuff from further afield. Not that I'm going to drink American beer in Amsterdam. You've no idea what condition it's going to be in. A definite win for the Amsterdam pub scene. I'll meet you there next time I'm in the 'Dam, Ron. The Volkshotel, where I always stay is not far from there. perhaps even a pub crawl taking in the Hesp as well? I have a fellow pisshead chum visiting Amsterdam tomorrow for a trade show and have forwarded on this link to him.If he only has time for five great beer bars in the city within a reasonable walk ( because he's obese ) what would you recommend other than Arendsnest which I already have. it depends if he's after trad, craft or both. And De Ooievaer at the start of Zeedijk. Just a lovely, tiny pub with some nice jenevers. And a couple of beers. If you think terrible things have been done to American beer on the way to the Netherlands then never ever drink them in Korea. I've never had beer with a fish off flavor before. 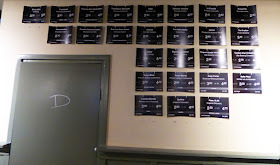 Many thanks for your list of bars all of which my chum visited during the drinking hours away from the trade show. He enjoyed every one of them. And he tried The Wateringhole too.Only four people in at 10pm and he wasn't too keen on the electronic beer menu behind the bar. His only other observation was like yours - how bloody expensive drink has become since he was last there. Thanks for your visit and the positive review! Really appreciate it. We don't sell American beers, for the same reason you mentioned. 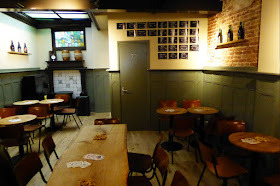 Last Friday we started with our Geuze and Lambic beers. This in addition to our 33 draft beers. Beers in bottles will only contain beers who can age (Geuze, sours, high alcohol dark ales). The bottles will also be 75cl. No competition for our fresh draft list.. In the (near) future we will serve cheese and meat platters as well. Pottekeis will soon be served with the Geuze beers. Tradition and local beers from Belgium and Holland, brewed by real breweries and brewers (no marketing brewers are allowed) complete our aim.